Not many players get the chance to win a big lottery prize, and even less can honestly say that they have won twice in a day. 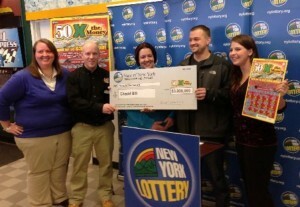 For Chadd Bill from Clay New York, this unlikely scenario came true when he beat the odds twice on February 27 and took home $3 million. 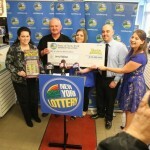 It all began with a warm-up ticket worth $200 that he bought earlier that day, and culminated with the jackpot that was also delivered by a scratch card. The 50X the Money scratch-off game won’t make him rich, as the winner chose to receive the money in the form of play 20 year annuity, but will solve many of his financial concerns. One of the first things that we hear about lottery games is that you don’t have a chance to win if you don’t play, and it looks like Chadd Bill took this motto seriously. Although he is an occasional lottery player, on that fateful day he made the right choice not to give up after winning $200. Bill didn’t rush to spend his profits or more tickets and took care of other pressing matters, and only purchased the second ticket later when he was picking up his boy from basketball. 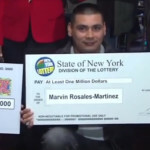 This time he chose the Sunoco APlus store as the location for buying a scratch off ticket, and the truth is that this wasn’t even his intention. The reason for why he stopped at that store was to enjoy a cup of coffee, but since the tickets vending machine was there he chose to buy another one. With only four tickets remaining in the machine, he quickly made the decision of buying all of them but it turns out that the first one was the winner. 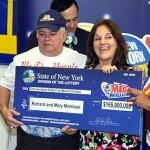 One can only imagine his surprise when he found out that he was a millionaire, and his wife was just as suspicious and assumes that her husband was playing a prank on her. Chadd Bill is a self-employed carpenter who works for Sullivan remodeling homes and has three young children, so the prize was a godsend. His kids were more concerned about their daddy paying the cable bill with the $200 prize, but although they are too young to realize it they now have a head start in life. Their parents chose the annuity prize and the main priority is to send the kids to a good college, without putting them through the tormenting affair of repaying student loans. The couple made a few comments about how the newfound wealth will help them sleep better at night knowing that they won’t have to worry about money on the long run. On the other hand, they claim that the jackpot won’t change them or their family and Chadd Bill says that he has no intention to quit work.